The weather on Monday (26 Oct 2009) was so nice and balmy today that despite having a splitting headache I chose to go for a short walk. 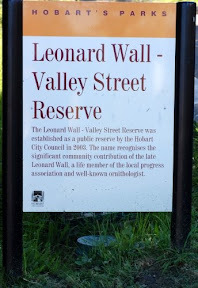 Having, in my absent mindedness forgotten how to get to the Knocklofty Park entrance, I settled for a short walk at the Leonard Wall – Valley Street Reserve. The small reserve is relatively new and was erected in 2003 in memory of the well known ornithologist Leonard Ernst Wall (1921-2004). The first impression of the place was that it is overun with weeds. Particularly prominet was the Meadow Foxtail (Alopecurus pratensis). This was the first time I’ve ever seen so much of this grass growing in one place. However, it is obvious that there have been some efforts to plant native species on the slopes of the reserve. In all, I counted at least 32 species of weeds and 30 native species there (See checklist). The highlight of my short walk must have been an old and imposing Blue Gum (Eucalyptus globulus) tree at the top of the reserve. It had ramified trunk right near the base and each trunk had a girth of say, over 2 meters. In the aerial photograph in the checklist page, the crown of this tree can be seen to cover a significant portion of the small reserve. By the size alone I doubt this Blue Gum was planted. If it was it must have been planted about a century ago. I imagine the tree must be a remnant of old Hobart, and has borne silent witness to all the changes that have taken place for the past century. What would such trees say if we could hear? 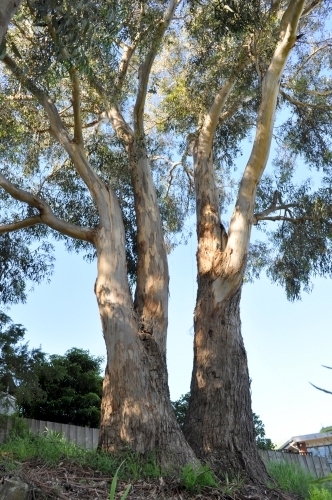 This entry was posted in Grasses, Parks and Nature Reserves, Rambles, Trees and tagged big trees, Blue Gum, Eucalyptus globulus, Leonard Ernst Wall, Leonard Wall, Leonard Wall - Valley Street Reserve, Myrtaceae, old trees. Bookmark the permalink.